The MD-2/TLR4 complex provides a highly robust mechanism for recognition and response of mammalian innate immunity to Gram-negative bacterial endotoxins. Despite overall close structural and functional similarity, human (h) and murine (m) MD-2 show several species-related differences, including the ability of hMD-2, but not mMD-2, to bind endotoxin (E) in the absence of TLR4. Wild-type mMD-2 can support TLR4-dependent cell activation by E only when mMD-2 and mTLR4 are coexpressed in the same cell. However, replacement of Glu122, Leu125, and/or Asn58 of mMD-2 with the corresponding residues (lysines) of hMD-2 was sufficient to yield soluble extracellular MD-2 that reacted with monomeric E · sCD14 complex to form extracellular monomeric E · MD-2 that activated cells expressing TLR4 without MD-2. Moreover, in contrast to wild-type mMD-2, double and triple mMD-2 mutants also supported E-triggered signaling in combination with human TLR4. Conversely, a K125L mutant of hMD-2 reacted with E · CD14 and activated TLR4 only when coexpressed with TLR4, and not when secreted without TLR4. These findings reveal novel roles of lysines 122, 125, and 58 in human MD-2 that contribute to the functional differences between human and murine MD-2 and, potentially, to differences in the sensitivity of humans and mice to endotoxin. Optimal host defense in many mammalian species, including humans and mice, against invading Gram-negative bacteria depends on innate immune recognition of endotoxin (E),3 unique and abundant surface glycolipids (LPS; lipooligosaccharides, LOS) of Gram-negative bacteria. Mobilization of host defenses in response to endotoxin is most efficiently effected by the ordered action of four cell surface and extracellular host proteins: LPS-binding protein (LBP), secreted (s) and GPI-linked membrane-bound forms of CD14, secreted (s) and membrane TLR4-associated forms of MD-2, and TLR4 (1, 2, 3). LBP and CD14 extract endotoxin monomers from the outer membrane of Gram-negative bacteria and aggregates of purified endotoxin, yielding monomeric E · CD14 complex (4), the preferred vehicle for transfer of endotoxin monomer to sMD-2, and MD-2 · TLR4 (5, 6). Simultaneous binding of MD-2 to endotoxin and to TLR4 ectodomain is required for TLR4-dependent cell activation by endotoxin (7, 8, 9). The structure and function of LBP, CD14, MD-2, and TLR4 have been most extensively studied in mice and humans. These studies have revealed a high degree of overall similarity in the mouse and human homologues of each of these proteins, yet there are notable differences in the specificity of ligand-induced activation of human vs murine TLR4 that, at least in some circumstances, appear to trace to structural and functional differences between human and murine MD-2 (10, 11). These functional differences have relied on studies in which either mouse or human MD-2 was coexpressed with mouse TLR4 (10, 12). In that experimental setting, hexa-acylated endotoxin and the bioactive lipid A moiety of endotoxin-activated mTLR4 coexpressed with either hMD-2 or mMD-2 (13, 14, 15). In contrast, tetra-acylated lipid A (lipid IVa) acts as a TLR4 agonist when mMD-2 is coexpressed with mTLR4 but as a TLR4 antagonist when hMD-2 is coexpressed with mTLR4 (10, 15). Similar species-dependent differences in TLR4 activation or antagonism have been demonstrated with taxol-related compounds that also trace to structural differences between human and mouse MD-2 (11, 16, 17, 18). Mutagenesis studies have revealed roles for amino acid residues 57, 61, and 122 of mMD-2 in the TLR4 agonist activity of lipid IVa (8). Other functional differences between human and murine MD-2 have also been described. These include the apparent ability of hMD-2, but not mMD-2, to react with LPS (e.g., LPS · CD14) when expressed and secreted without TLR4 and to form a functional receptor with human TLR4 (13, 15, 19). These observations indicate additional functional differences resulting from the discrete structural differences between human and mouse MD-2. One particularly notable structural difference is in the charge properties of hMD-2 and mMD-2. hMD-2 is more cationic, particularly within the region encompassing residues at the rim of the hydrophobic pocket of MD-2 where much of lipid A binds (20, 21, 22, 23, 24). In hMD-2, this region contains several basic amino acids, including lysines 122 and 125 that are not present in mMD-2. We have therefore focused in this study on cationic residues in this region of hMD-2 to determine whether they play a role in secretion of bioactive sMD-2 and in functional interactions with hTLR4. The human embryonic kidney (HEK) 293 cells were provided by Dr. J. Chow (Eisai Research Institute, Andover, MA). HEK293 cells stably transfected with TLR4 (HEK293/TLR4 no. BF1) were provided by Dr. Douglas Golenbock (University of Massachusetts Medical Center, Worcester, MA) and Dr. Andra Schromm (Research Center Borstel, Germany). HEK293T cells were used for the analysis of complex formation between LOS and MD-2 using gel filtration chromatography and in immunoblotting experiments. S-LPS (from Salmonella abortus equi HL83) was prepared by a phenol extraction procedure and was provided by Dr. Brandenburg (Research Center Borstel, Germany). Purified [3H]LOS (25,000 cpm/pmol) was isolated from an acetate auxotroph of Neisseria meningitidis serogroup B after metabolic labeling, as described (25). Sephacryl S500 and S200 HR size exclusion gel matrices were purchased from GE Healthcare. Human serum albumin (HSA) was obtained as an endotoxin-free, 25% stock solution (Baxter Health Care). Anti-tetra-his Abs and goat anti-mouse HRP-conjugated secondary Abs were from Qiagen and Jackson ImmunoResearch Laboratories, respectively. LBP and sCD14 were gifts from XOMA and Amgen, respectively. All mutations were introduced into pEFBOS-h or m MD-2-FLAG-His plasmid using a QuikChange site-directed mutagenesis kit (Stratagene) according to the manufacturer’s instructions. All plasmids were sequenced to confirm the mutation. Primer sequences will be made available upon request. [3H]LOSagg and [3H]LOS · sCD14 complex were prepared as previously described (14, 15, 16). In brief, [3H]LOSagg (Mr > 20 × 106) were obtained after hot phenol extraction of [3H]LOS followed by ethanol precipitation of [3H]LOSagg, and ultracentrifugation. Monomeric [3H]LOS · CD14 complexes (Mr ∼ 60,000) were prepared by treatment of [3H]LOSagg for 30 min at 37°C with substoichiometric LBP (molar ratio 100:1 LOS:LBP) and 1–1.5 × molar excess sCD14 followed by gel exclusion chromatography (Sephacryl S200, 1.6 × 70 cm column) in PBS (pH 7.4), 0.03% HSA to isolate monomeric [3H]LOS · sCD14 complex. Radiochemical purity of [3H]LOSagg and [3H]LOS · sCD14 was confirmed by Sephacryl S500 (LOSagg) or S200 ([3H]LOS · sCD14) chromatography (13, 15). HEK293T cells were plated in a 6 well-plate with 10% FBS in DMEM. On the following day, cells were transfected with either an expression plasmid encoding MD-2 alone or cotransfected with expression plasmids encoding MD-2 and TLR4ecd using PolyFect reagent (Qiagen), as previously described (26). After 12–16 h, the medium was replaced with 1.5 ml of serum-free medium (DMEM, Invitrogen) supplemented with 0.1% HSA. In some experiments, as indicated in the legends to the figures, [3H]LOS · sCD14 (1 nM) was added (spiked) at the time of addition of serum-free medium to the transfected cells to permit reaction of newly secreted MD-2 ± TLR4ecd with [3H]LOS · sCD14. Reaction products were analyzed by Sephacryl HR S200 (1.6 × 70 cm) chromatography in PBS. Fractions (0.5 ml) were collected at a flow rate of 0.5 ml/min at room temperature using AKTA Purifier or Explorer 100 fast protein liquid chromatography (GE Healthcare). Radioactivity in collected fractions was analyzed by liquid scintillation spectroscopy (Beckman LS liquid scintillation counter). Recoveries of [3H]LOS were ≥70% in all cases. All solutions used were pyrogen-free and sterile-filtered. HEK293 cells were seeded into 96-well Costar plates (Corning) at 5 × 104 cells/well (HEK293 no. BF1 hTLR4 cells were seeded at 7 × 104) and incubated overnight in a humidified atmosphere (5% CO2) at 37°C. The next morning, cells were cotransfected for 4 h with Flag-CMV1- (human or murine) TLR4 and pEFBOS- (wild-type (wt) or mutant, human or murine) MD-2-FLAG-His together with NF-κB-dependant luciferase and constitutive Renilla reporter plasmids using Lipofectamine 2000 (Invitrogen). After 4 h, medium was changed with DMEM plus 10% FBS. The following day cells were stimulated with S-LPS, as indicated, for 16 h. In selected experiments, HEK293 cells (6 × 105/well) were seeded into 6-well plates and separately transfected either with MD-2 (wt or mutant, human or murine) or with mTLR4 plus NF-κB-dependent luciferase and constitutive Renilla reporter plasmids. After 16 h, the cells were resuspended in fresh medium containing 10% serum, joined in 1:1 ratio and re-seeded together in 96-well plates to yield cocultures of cells separately expressing TLR4 or MD-2. After incubation with S-LPS, cells were lysed in 1× reporter assay lysis buffer (Promega) and analyzed for reporter gene activities using a dual-luciferase reporter assay system on a Mithras LB940 luminometer. Relative luciferase activity (RLA) was calculated by normalizing each sample’s luciferase activity for constitutive Renilla activity measured within the same sample. When plotting data the value of the unstimulated sample with wt hMD-2 was set to 1 and other values were adjusted accordingly. To detect polyhistidine labeled wt and mutant MD-2, an anti-polyhistidine Ab (Tetra-His Ab, Qiagen) was used. We expressed wt MD-2 and MD-2 mutants in HEK293T cells, which do not express MD-2 without transfection with expression plasmids encoding MD-2 (15, 17). HEK293T cells were transiently transfected with wt or mutant MD-2 using PolyFect (Qiagen) as a transfection reagent. The medium was changed 12 h posttransfection and replaced with serum-free medium. After 24 h, the supernatant from the same number of cells in the culture was collected and separated by electrophoresis (Bio-Rad mini gel system) through a 4–15% gradient acrylamide gel (Tris/HEPES/SDS buffer) and transferred to nitrocellulose membrane. In parallel, recovered cell pellets were lysed and similarly evaluated for MD-2 content. Nitrocellulose membrane was washed with TBS (pH 7.5), containing 0.05% Tween 20 and 0.2% Triton X-100 (TBSTT), blocked to reduce nonspecific background with 3% BSA in TBSTT for 1 h at 25°C, and incubated with the anti-His4 Ab in TBSTT overnight. After washing with TBSTT, the membrane was incubated with goat anti-mouse IgG conjugated to HRP (Bio-Rad) for 1 h at 25°C in TBS containing 3% goat serum and washed with TBSTT. Blots were developed using Pierce SuperSignal substrate system. By reducing immunoblot samples each MD-2 species was converted to the monomeric form, migrating as a triplet (hMD-2) or quadruplet (mMD-2) due to differences in glycosylation (27). Recovered extracellular medium (supernatants) were immunoblotted to confirm that levels of expression of wt and mutant MD-2 were comparable. Murine MD-2 has a significantly lower isoelectric point than human MD-2, resulting in a different electrostatic potential. Charge differences between human and murine MD-2 include residues close to the LPS binding pocket that are positively charged in the human MD-2 homologue (Fig. 1⇓). To determine whether these cationic residues contribute to functional differences between human and murine MD-2, we first examined effects on MD-2 expression and secretion. This was accomplished by immunoblots of harvested cell lysates and extracellular medium from transiently transfected HEK293T cells expressing either wt human or murine MD-2 or the mMD-2 mutants. Fig. 2⇓A shows that there was drastically lower extracellular accumulation of wt mMD-2 compared with hMD-2 and a greater accumulation of wt mMD-2 within the cells, indicating substantial differences in secretion rather than synthesis and overall accumulation of wt human and murine MD-2 by the transfected cells. Remarkably, mutation of a single residue, Glu122 to Lys (but not Asn58 to Lys), markedly increased extracellular accumulation of mMD-2 (Fig. 2⇓B). Combined mutations of E122, L125, and/or N58 of mMD-2 with the corresponding residues (lysines) of hMD-2 further increased extracellular accumulation of these mMD-2 mutants to levels comparable to that of wt hMD-2 (Fig. 2⇓B). Increased recovery of the mMD-2 mutant proteins in the extracellular medium was paralleled by decreased recovery in cell lysates, indicating an increase in secretion of the mutant vs wt mMD-2 species. Differences in charged amino acid residues at the rim of the LPS binding pocket of human vs murine MD-2. Ribbon model of the three-dimensional structure of mMD-2 with side chains of residues N58, E122, and L125 shown in magenta, orange, and red, respectively (lysines in hMD-2). Lipid A is shown as a stick model in green. Model was prepared by UCSF Chimera (40 ) based on the coordinates of mMD-2 (PDB code 2Z64) with lipid A docked from the TLR4 · MD-2 · Ra-LPS complex (PDB code 2FXI) (20 22 ). Increased extracellular accumulation of mMD-2 mutants with increased positive charge. A and B, HEK293T cells were transiently transfected with expression plasmids (pEF-BOS) encoding FLAG-His tagged wt hMD-2, wt mMD-2, or mMD-2 mutants. After 24 h, the supernatants were collected and cells were lysed. Supernatants and lysates were analyzed by SDS-PAGE (+ DTT)/immunoblot using anti-Tetra-His Abs. Differences in migration of individual hMD-2 and mMD-2 reflect differences in glycosylation. Cell lysates and supernatant from the equal number of cells were loaded in each lane. Results are representative of two or more experiments. To test the ability of the secreted mouse sMD-2 mutants to bind endotoxin, we made use of a recently developed assay to sensitively and quantitatively measure the transfer of [3H]LOS from [3H]LOS · sCD14 to MD-2 in the culture medium of transfected HEK293T cells expressing and secreting sMD-2 (28). As shown in Fig. 3⇓A, nearly all [3H]LOS · sCD14 added (spiked) to the culture medium of cells expressing and secreting hMD-2 was converted to [3H]LOS · MD-2. In contrast, there was no conversion of [3H]LOS · sCD14 to [3H]LOS · MD-2 when wt mMD-2 was expressed, consistent with the much lower levels of extracellular wt murine vs human MD-2 (Fig. 2⇑). However, even the E122K mutant mMD-2, which is secreted to a much greater extent than wt mMD-2 (Fig. 2⇑B), did not react with [3H]LOS · sCD14 in the culture medium to form [3H]LOS · MD-2 (Fig. 3⇓B), indicating that the low level of secreted mMD-2 is not the only reason for its inability to react with [3H]LOS · sCD14 when expressed without TLR4. Combined substitutions of E122, L125, and N58 of mMD-2 with the corresponding lysine residues of hMD-2 yielded extracellular sMD-2 that reacted with [3H]LOS · sCD14 to form a monomeric [3H]LOS · MD-2 complex (Fig. 3⇓C). These findings suggest an important role of lysines 125 and 58, in addition to lysine 122, in the reactivity of extracellular mutant murine sMD-2 with [3H]LOS · sCD14. Reaction of secreted wt human and mouse MD-2 and mMD-2 mutants with [3H]LOS · sCD14. A–C, HEK293T cells were transiently transfected with plasmids encoding wt MD-2 or mMD-2 mutants. After ∼24 h, the transfection medium was changed with serum-free medium and spiked with 1 nM [3H]LOS · sCD14. Medium was harvested after 24 h and analyzed by Sephacryl S200 chromatography. Resolved reactants and products were monitored by liquid scintillation spectroscopy. Note that the reaction of monomeric [3H]LOS · sCD14 with sMD-2 yields monomeric [3H]LOS · MD-2. Elution volumes of [3H]LOS · sCD14 and [3H]LOS · MD-2 were at 37 and 42 ml, respectively. Medium from untransfected cells spiked with 1 nM [3H]LOS · sCD14 was used as a negative control. The results shown are representative of three or more closely similar experiments. In contrast to the marked differences in secretion and extracellular function of wt human and murine MD-2 (Figs. 2⇑ and 3⇑), cells coexpressing wt human or mouse MD-2 with mTLR4 are similarly responsive to TLR4-activating (hexaacylated) endotoxin species (Ref. 10, 15, 29 ; Fig. 4⇓A). Mutants of mMD-2 that were secreted to a much greater extent than wt mMD-2 (when expressed without TLR4; Fig. 2⇑B) and showed much greater reactivity with [3H]LOS · sCD14 as sMD-2 (Fig. 3⇑C) were not, by contrast, much more active than wt mMD-2 when coexpressed with mTLR4 (Fig. 4⇓A). In contrast to the similar activity of wt and mutant mMD-2 (and wt hMD-2) when coexpressed with mTLR4, only MD-2 species that were highly reactive with E · sCD14 after secretion without TLR4 (e.g., wt human MD-2 and mMD-2 E122K · L125K ± N58K) conferred activation of HEK293/mTLR4 cells by LPS (Fig. 4⇓B). The above studies suggest that, whereas mouse cells coexpressing MD-2 and TLR4 are highly responsive to endotoxin (e.g., LOS or LPS), mouse cells expressing TLR4 alone without MD-2 remain virtually unresponsive to endotoxin even if there are neighboring cells expressing wt MD-2 in excess of TLR4. To model more closely this circumstance, we tested the responsiveness of HEK293/mTLR4 cells to LPS (in the presence of serum to provide LBP and sCD14) when cocultured with cells expressing wt human or murine MD-2 or selected mutants of mMD-2. Fig. 4⇓C shows that only when HEK293/mTLR4 cells were cocultured with cells secreting sMD-2 species that were highly reactive with LOS · sCD14 were these cells highly responsive to added LPS. Coexpression of mMD-2 and mTLR4 or high reactivity of sMD-2 species with extracellular E · sCD14 is required for endotoxin-triggered activation of mTLR4. A, Wild-type mMD-2 confers endotoxin responsiveness to HEK293 cells when coexpressed with mTLR4. HEK293 cells were transiently transfected with expression plasmids encoding MD-2 together with mTLR4 and a NF-κB-dependent luciferase reporter plasmid. After 24 h, the cells were stimulated with S-LPS for 16 h in the presence of serum. The cells were lysed and assayed for luciferase activity. The results shown are means ± SEM RLA from three independent experiments. 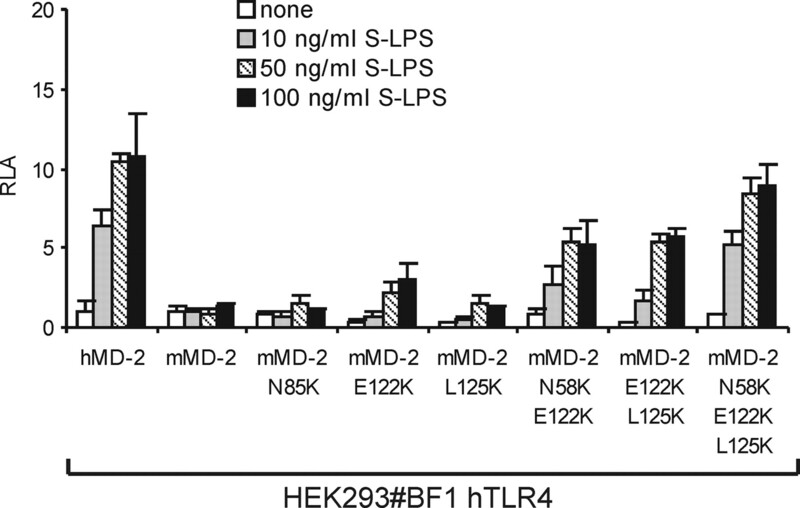 B, Activation of HEK293/mTLR4 cells by LPS requires sMD-2 that is reactive with E · sCD14. HEK293 cells were transiently transfected with plasmids encoding MD-2. After 24 h, harvested medium containing 10% serum (to provide LBP and sCD14) and sMD-2 were incubated with S-LPS (100 ng/ml) and then added to HEK293 cells that had been transfected with a plasmid encoding mTLR4 together with NF-κB-dependent luciferase reporter plasmid. The cells were lysed after 16 h and assayed for luciferase activity. The results shown are means ± SEM RLA from three independent experiments. C, Only sMD-2 highly reactive with E · sCD14 can confer ectopic LPS responsiveness to cells expressing mTLR4. HEK293 cells were transiently transfected with plasmids encoding MD-2 or mTLR4 together with NF-κB-dependent luciferase reporter plasmid, as described in Materials and Methods. After 16 h, both sets of cells were resuspended in fresh medium containing 10% serum, joined and reseeded. After adherence to the plate, the cells were stimulated with S-LPS for 16 h. The cells were then lysed and assayed for luciferase activity. The results shown are means ± SEM RLA from three independent experiments. The ability of wt mMD-2 to support activation of mTLR4 by endotoxin when mMD-2 and mTLR4 were coexpressed suggested that association of mMD-2 with mTLR4 (ectodomain) was needed for reactivity of wt mMD-2 with [3H]LOS · sCD14. To test this hypothesis, experiments were repeated with cells coexpressing wt human or mouse MD-2 and human or mouse TLR4ecd. Addition of [3H]LOS · sCD14 to the culture medium of cells expressing wt human MD-2 and murine or human TLR4ecd resulted in nearly complete conversion of [3H]LOS · sCD14 to earlier eluting (Mr ∼ 190,000) and later eluting (Mr ∼ 25,000) [3H]LOS-containing complexes (Fig. 5⇓A) representing, respectively, ([3H]LOS · MD-2 · TLR4ecd)2 (30) and [3H]LOS · MD-2 (28). By contrast, coexpression of wt mMD-2 with mTLR4ecd resulted in conversion of [3H]LOS · sCD14 to ([3H]LOS · MD-2 · TLR4ecd)2 but not to [3H]LOS · MD-2, consistent with a requirement for association of mMD-2 with TLR4ecd for reaction of wt mMD-2 with [3H]LOS · CD14. Coexpression of wt mMD-2 with human TLR4ecd, in contrast, resulted in little or no formation of ([3H]LOS · MD-2 · TLR4ecd)2 in a culture medium spiked with [3H]LOS · sCD14 (Fig. 5⇓A), consistent with a species-specific association of mMD-2 with mTLR4ecd (13). Reactivity of wt and mutant human and murine MD-2 with [3H]LOS · sCD14 when coexpressed and secreted with murine or human TLR4 ectodomain. A–C, HEK293T cells were cotransfected with plasmids encoding wt or mutant human or mouse MD-2 and plasmids encoding human (h) or murine (m) TLR4ecd, as indicated. After ∼24 h, the transfection medium was changed with serum-free medium and spiked with 1 nM [3H]LOS · sCD14. Medium was harvested at 24 h and analyzed directly by Sephacryl S200 chromatography. Resolved reactants and products were monitored by liquid scintillation spectroscopy. Note that the reactions of [3H]LOS · sCD14 with MD-2· TLR4ecd yields a [3H]Mr ∼190 kDa complex ([3H]LOS · MD-2 · TLR4ecd)2 (which elutes at around 31 ml) whereas reaction of [3H]LOS · sCD14 with sMD-2 yields [3H]LOS · MD-2. The results shown are representative of two or more closely similar experiments. The inability of wt mMD-2 to react with [3H]LOS · sCD14 to form ([3H]LOS · MD-2 · TLR4ecd)2 when coexpressed with hTLR4ecd paralleled its inability to reconstitute sensitive endotoxin responsiveness in a cell expressing hTLR4 (Ref. 10, 13 ; Fig. 6⇓). 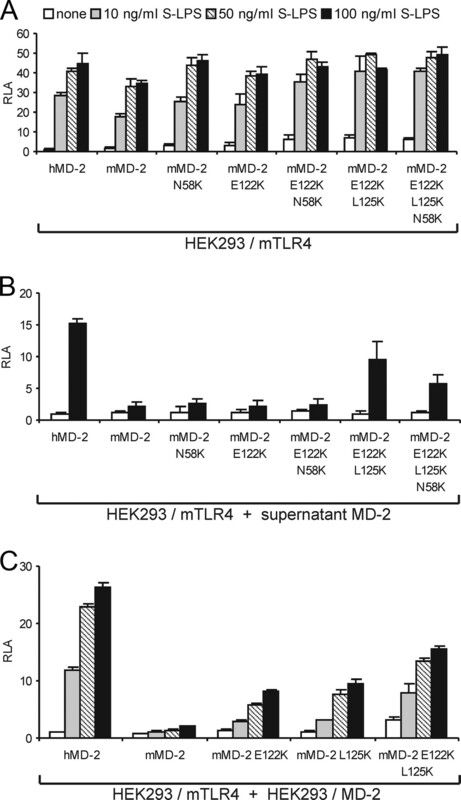 However, mutants of mMD-2 in which residues 58, 122, and/or 125 were substituted with lysines, as in hMD-2, conferred endotoxin responsiveness upon cells expressing human TLR4 (Fig. 6⇓). Thus, lysines at these sites in MD-2 not only promote secretion and function of sMD-2 without TLR4 but also activation of human TLR4. It should be noted, however, that there was greater formation of ([3H]LOS · MD-2 · TLR4ecd)2 when either wt or mutant MD-2 species were coexpressed with mouse rather than human TLR4ecd (compare Fig. 5⇑, B and C). This paralleled the greater endotoxin responsiveness of cells coexpressing wt or mutant mMD-2 with mouse rather than human TLR4 (compare Figs. 4⇑A and 6⇓). Mutants of mMD-2 with increased cationic properties confer endotoxin responsiveness to cells coexpressing human TLR4. HEK293 no. BF1 cells stably expressing hTLR4 were transiently transfected with expression plasmids encoding wt or the indicated mutant MD-2 together with NF-κB-dependent luciferase reporter plasmid. After 24 h, cells were stimulated with different concentrations of S-LPS for 16 h in the presence of 10% FBS. The cells were lysed and assayed for luciferase activity. The results shown are means ± SEM RLA from three independent experiments. The above findings indicate that the inability of wt mMD-2 to form bioactive sMD-2 can be (partially) overcome by substitution of residues 58, 122, and 125 with the lysine residues that are present in wt human but not mouse MD-2. To test the importance of lysines 122 and 125 in the ability of human MD-2 to form bioactive sMD-2 when expressed without TLR4, these residues in human MD-2 were replaced with the corresponding amino acids present in wt mMD-2. Fig. 7⇓A shows that there were no major differences in expression or extracellular accumulation of wt, K122E, or K125L mutants of hMD-2. These point mutations, however, compromised the reactivity of sMD-2 with [3H]LOS · sCD14, modestly in the case of the K122E hMD-2 mutant and virtually completely in the case of the K125L mutant (Fig. 7⇓B). This inability of hMD-2 K125L to yield bioactive sMD-2, as judged by its inability to react with [3H]LOS · sCD14 to form [3H]LOS · MD-2, paralleled its inability to support activation of HEK293/TLR4 cells by added LPS (in the presence of serum) when the HEK293/TLR4 cells were cocultured with medium containing hMD-2 K125L or with cells expressing and secreting hMD-2 K125L rather than wt hMD-2 (Fig. 7⇓C). Effects of substitution of lysine 122 or 125 of hMD-2 with the corresponding amino acids of mMD-2 on secretion and function of sMD-2. A, Expression and extracellular accummulation of wt, K122E, and K125L hMD-2. HEK293T cells were transiently transfected with expression plasmids (pEF-BOS) encoding FLAG-His tagged wt hMD-2 or the indicated hMD-2 mutants. After 24 h, the supernatants were collected and cells were lysed. Supernatants and lysates were analyzed by SDS-PAGE (+ DTT)/immunoblot using anti-Tetra-His Abs. (-)C indicates mock transfected cells. B, Comparison of reactivity of mutant human sMD-2 with [3H]LOS · sCD14. HEK293T cells were transiently transfected with plasmids encoding hMD-2 mutants. After ∼24 h, the transfection medium was changed with serum-free medium and spiked with 1 nM [3H]LOS · sCD14. Medium was harvested after 24 h and analyzed by Sephacryl S200 chromatography, as described in the legend to Fig. 3. For controls with wt MD-2 see Fig. 3A. The results shown are representative of three or more closely similar experiments. C, Comparison of ability of wt and K125L hMD-2 to promote LPS-triggered activation of HEK293/(murine or human) TLR4 cells. Left, HEK293 cells were transiently transfected with plasmids encoding wt hMD-2 or K125L hMD-2. After 24 h, harvested medium containing 10% serum from cells expressing MD-2 were incubated with S-LPS and then added to HEK293 no. BF1 cells that had been transfected with NF-κB-dependent luciferase reporter plasmid as in Fig. 4B. Right, HEK293 cells were transiently transfected with plasmids encoding MD-2 or mTLR4 together with NF-κB-dependent luciferase reporter plasmid. After 16 h, both sets of cells were resuspended in fresh medium containing 10% serum, joined, and reseeded. Cells were then stimulated with S-LPS, lysed and assayed for luciferase activity as in Fig. 4C. The results shown are means ± SEM RLA from three independent experiments. Much like wt mMD-2, hMD-2 K125L retained substantial MD-2 activity when coexpressed with TLR4 as judged by support of TLR4 activation by LPS (Fig. 8⇓A) and reaction with [3H]LOS · sCD14 to form the ternary ([3H]LOS · MD-2 · TLR4ecd)2 (Mr ∼190,000) complex (Fig. 8⇓B). By contrast, the K122E mutant of hMD-2, despite reactivity with [3H]LOS · sCD14 (± hTLR4ecd) (Figs. 7⇑B and 8⇓B), was much less effective in supporting TLR4 activation by LPS (Fig. 8⇓A). 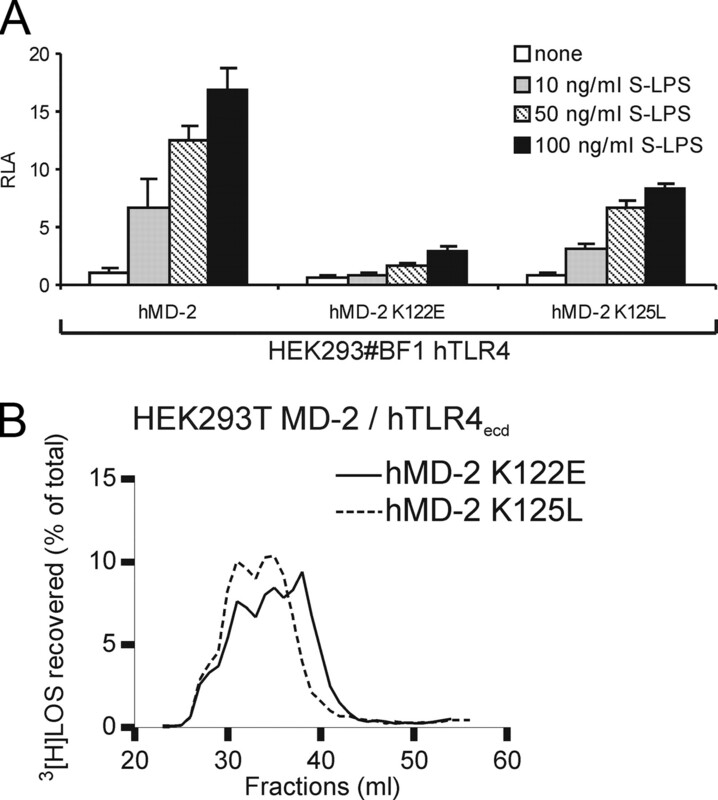 K125L mutant of hMD-2 supports TLR4-dependent cell activation by LPS when coexpressed with hTLR4. A, HEK293 no. BF1 cells stably expressing hTLR4 were transiently transfected with expression plasmids encoding wt, K122E, or K125L hMD-2 together with a NF-κB-dependent luciferase reporter plasmid. After 24 h, cells were stimulated with S-LPS for 16 h in the presence of 10% FBS. The cells were lysed and lysates were analyzed for luciferase activity. The results shown are means ± SEM RLA from three independent experiments. B, Coexpression (association) of hTLR4 ectodomain rescues reactivity of hMD-2 K125L mutant with [3H]LOS · sCD14. HEK293T cells were cotransfected with plasmids encoding mutant MD-2 and plasmids encoding hTLR4ecd. After ∼24 h, the transfection medium was changed with serum-free medium and spiked with 1 nM [3H]LOS · sCD14. Medium was harvested after 24 h and analyzed directly by Sephacryl S200 chromatography as described in the legend to Fig. 5. For controls with wt MD-2 see Fig. 5A. The results shown are representative of two or more closely similar experiments. Despite similar tertiary structure (11), differences in the primary structure of MD-2 from different species can lead to differences in binding of certain endotoxin (lipid A) species and mimetics (e.g., taxol) or in the ability of these ligands to act as TLR4 agonists (17, 18). The investigation of the basis of the selective agonistic effect of tetraacylated lipid A on murine vs human MD-2 · TLR4 has revealed contribution of several regions of murine MD-2 (31, 32, 33), but the precise structural basis of the agonistic properties of these compounds with mMD-2 · mTLR4 but not with hMD-2 · mTLR4 is still not fully understood. In this study, we have uncovered additional functional differences between human and murine MD-2, including the ability of human but not murine MD-2 to be secreted and function as an extracellular endotoxin-binding protein in the absence of TLR4. The differences seen are striking, with mMD-2, in contrast to hMD-2, barely detectable in the recovered conditioned medium of transiently transfected HEK293 cells (Fig. 2⇑A). Less extracellular mMD-2, vs hMD-2, is paralleled by increased murine vs human MD-2 in the recovered cells (Fig. 2⇑A) indicating that the lower extracellular accumulation of mMD-2 is due not to reduced synthesis or increased intracellular degradation of mMD-2 but rather reduced secretion. Our experiments further suggest that a major determinant of differences in secretion of human vs murine MD-2 from transfected HEK293 cells are differences in the few cationic residues of human vs murine MD-2. As summarized in Fig. 1⇑, these differences are concentrated along the edge of the hydrophobic lipid A binding pocket of MD-2 (21, 22, 23). 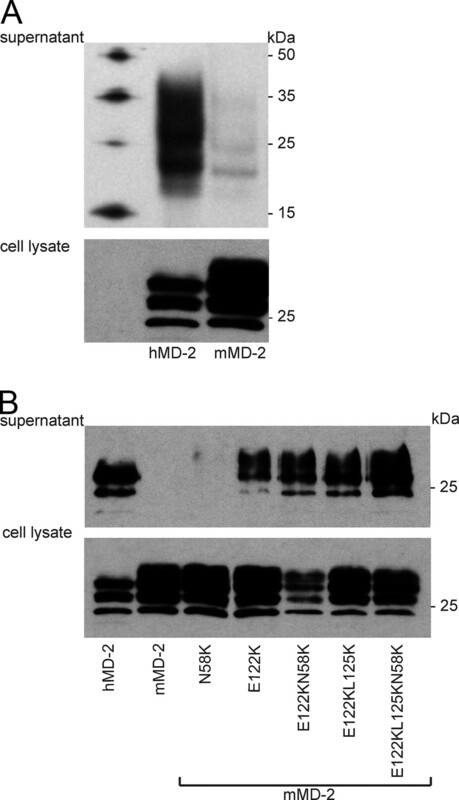 Substitution of just a single residue of mMD-2 in this region with a basic residue found in human MD-2 (i.e., E122K mutant of mMD-2) induced a substantial increase in secretion and recovery of extracellular mMD-2 that was further increased in double and triple mutants by combining replacements of selected nonbasic residues of mMD-2 with the lysines present in hMD-2 (e.g., E122K ± L125K ± N58K) (Fig. 2⇑B). Although we cannot exclude the possibility that additional sites contribute to differences in secretion of hMD-2 and mMD-2, the fact that the triple mutant (E122K · L125K · N58K) of mMD-2 is secreted to roughly the same extent as hMD-2 (Fig. 2⇑B) suggests that these three residues are sufficient to account for the dramatic differences in secretion of human and murine MD-2. Whether the effects of lysines 122, 125, and 58 on secretion of MD-2 reflect the effects on the global charge properties (e.g., isoelectric point, net charge) of MD-2 or more specific and localized roles of these lysines remains to be determined. 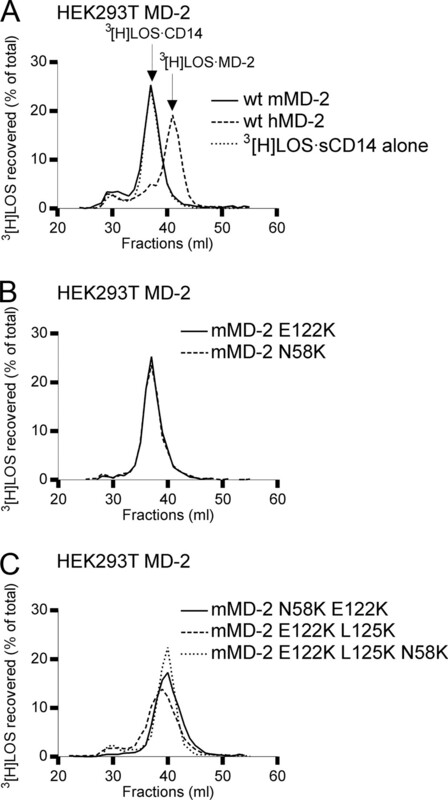 There is a small amount of wt mMD-2 secreted from transfected HEK293 cells (Fig. 2⇑A). This can be more readily appreciated when the sMD-2 in the conditioned medium is concentrated by immunoprecipitation (Ref. 6 ; data not shown). However, secreted wt mMD-2 has no detectable functional activity as assessed either by reactivity with [3H]LOS · sCD14 spiked into the culture medium (Fig. 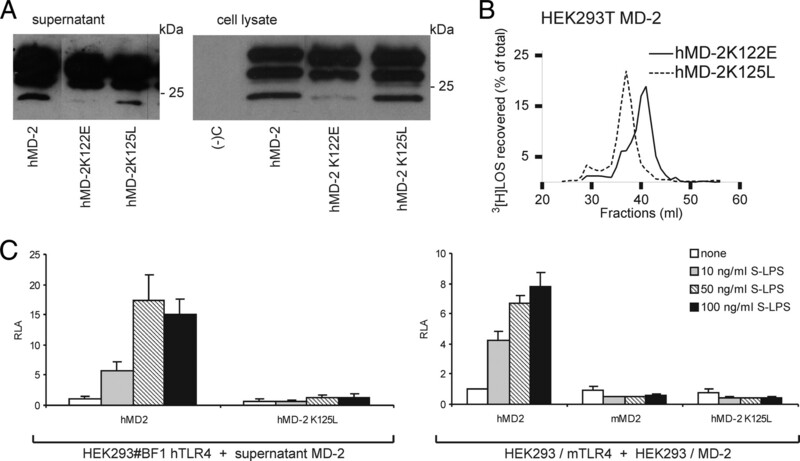 3⇑A) or by support of LPS-triggered activation of HEK293/mTLR4 cells (Fig. 4⇑, B and C). Single lysine substitution of residue 58, 122, or 125 of mMD-2 conferred little or no detectable activity (Figs. 3⇑B and 4⇑, B and C). Only the combination of two or more lysine substitutions (e.g., the E122K mutation with the N58K and/or L125K mutations) yielded secreted mMD-2 species that reacted efficiently with spiked [3H]LOS · sCD14 in the culture medium to produce [3H]LOS · MD-2 (Fig. 3⇑C). Remarkably, whereas the E122K · N58K and E122K · L125K mMD-2 double mutants showed similar secretion and reactivity with [3H]LOS·sCD14, activation of HEK293/mTLR4 cells was significantly greater with the E122K · L125K mutant (Fig. 4⇑B). Taken together, these findings suggest important roles of lysines 122 and 125 in: 1) secretion of MD-2 when MD-2 is expressed by cells in the absence (or molar excess) of TLR4; 2) reaction of secreted MD-2 with LOS (or LPS) ·sCD14 to form LOS (or LPS) ·MD-2; and 3) activation of TLR4 by the resulting soluble (extracellular) LOS (LPS) ·MD-2 complex. The comparative properties of the various mMD-2 mutants indicate that the structural requirements for secretion of MD-2 are less stringent than those for transfer of endotoxin from LOS · sCD14 to sMD-2 (e.g., E122K vs E122K · N58K) and requirements for TLR4 activation are most stringent (E122K · N58K vs E122K · L125K). The properties of the K125L and K122E mutants of hMD-2 are consistent with this view as these mutants show markedly reduced functional activity without diminution of secretion of sMD-2 (Figs. 7⇑ and 8⇑). How the presence of lysines at residues 122, 125, and 58 increases MD-2 secretion and function is not yet clear. However, an important clue is provided by the finding that coexpression of mMD-2 with mTLR4 eliminates the need for lysines at these sites in MD-2 (Fig. 4⇑A). This finding clearly indicates that those lysine residues are not needed for direct interactions of mMD-2 with mTLR4 but rather for MD-2 to be secreted without TLR4 and subsequently interact as a soluble extracellular protein with endotoxin and/or TLR4. The reactivity of MD-2 with TLR4 and endotoxin.CD14 requires presentation of MD-2 in monomeric form (6, 34, 35) High affinity interactions of MD-2 with TLR4 yield stable heterodimers (MD-2 · TLR4) in which MD-2 remains in monomeric form, highly reactive with E · CD14. Wild-type human MD-2 when expressed in mammalian cells without TLR4 is secreted, at least in part, as a bioactive monomer that loses reactivity with TLR4 and endotoxin in a time- and temperature-dependent fashion, accumulating in the extracellular medium of mammalian cell cultures and in body fluids as a mixture of inactive multimers (6, 34, 35, 36). The virtual absence of secreted bioactive wt or N58K mMD-2 and the limited activity of E122K and L125K even when cells expressing these species of mMD-2 were cultured in medium containing [3H]LOS · sCD14 (Fig. 3⇑B) or cocultured with cells expressing mTLR4 (Fig. 4⇑C) suggests that whatever mMD-2 is secreted is already inactive or very rapidly loses reactivity with endotoxin and TLR4 after secretion. Because these same mMD-2 species are active when coexpressed with mTLR4 (Figs. 4⇑A and 5⇑, A and C), we believe that their dependence on TLR4 for secretion and extracellular function may reflect a dependence on interactions with TLR4 for remaining in an active, monomeric form. Additionally, we prepared recombinant mMD-2 in bacterial cells based on the same procedure as previously for human MD-2 (23). Recombinant mMD-2 in contrast to human MD-2 however did not bind LPS and did not activate TLR4-transfected HEK293 cells (data not shown). Accordingly, we speculate that the greater cationic character of human vs murine MD-2, conferred by lysines 122, 125, and 58, increases the stability of bioactive MD-2 monomers in the absence of TLR4. The inability of wt mMD-2 to form a functional receptor with hTLR4, in contrast to mTLR4, has been shown previously (10, 13) and again in this study (compare Fig. 6 to 4A). This species-selective interaction of mMD-2 with TLR4 has been traced to distinguishing properties of the N-terminal region of murine and human TLR4 that determine preassembly of functional MD-2 · TLR4 heterodimers on the surface of cells coexpressing MD-2 and TLR4 before exposure to endotoxin (19). What distinguishing features of wt human and murine MD-2 account for the ability of hMD-2, but not mMD-2, to form a functional receptor with hTLR4 is not known. 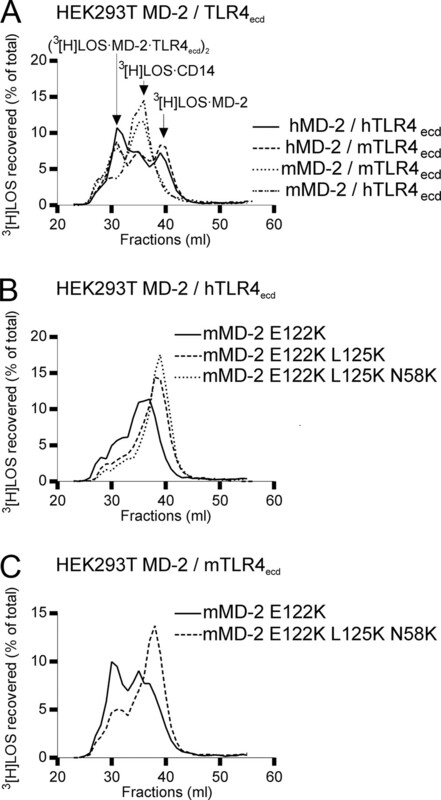 The increased activity of E122K · L125K · N58K mMD-2 with hTLR4 (Fig. 6⇑) suggests that these lysines have a role, either directly or indirectly. Of note, equine MD-2 that has basic residues at positions 122, 125, and 58 confers LPS-induced activation in combination with hTLR4 (32), supporting our conclusions. Although wt mMD-2 cannot form functional agonist-independent interactions with hTLR4, binding between wt mMD-2 and hTLR4 ectodomain has been observed (13). Activation of TLR4 by endotoxin requires dimerization of two endotoxin · MD-2 · TLR4 complexes, mediated by agonist-independent MD-2 · TLR4 (N-terminal region) interactions within each complex and agonist-induced (endotoxin·)MD-2 · TLR4 interactions between two neighboring complexes (20, 37). The crystal structure and model of hMD-2 · hTLR4ecd (20, 22) suggests that Lys125 is in contact with ectodomain of the second TLR4 molecule through backbone interactions, while Lys122 interacts with the phosphate groups of the ligand. However, the properties of the K122E mutant of hMD-2 (near normal secretion and reactivity with [3H]LOS·sCD14 as sMD-2 ± TLR4ecd but markedly reduced LPS-triggered TLR4 activation; Figs. 7⇑ and 8⇑) as well as the crystal structure of activating LPS · MD-2 · TLR4ecd complex (20) suggest a more direct role of lysine 122 in agonist-dependent interactions of E · MD-2 with TLR4 and differences in the docking of the lipid A between human and murine MD-2. 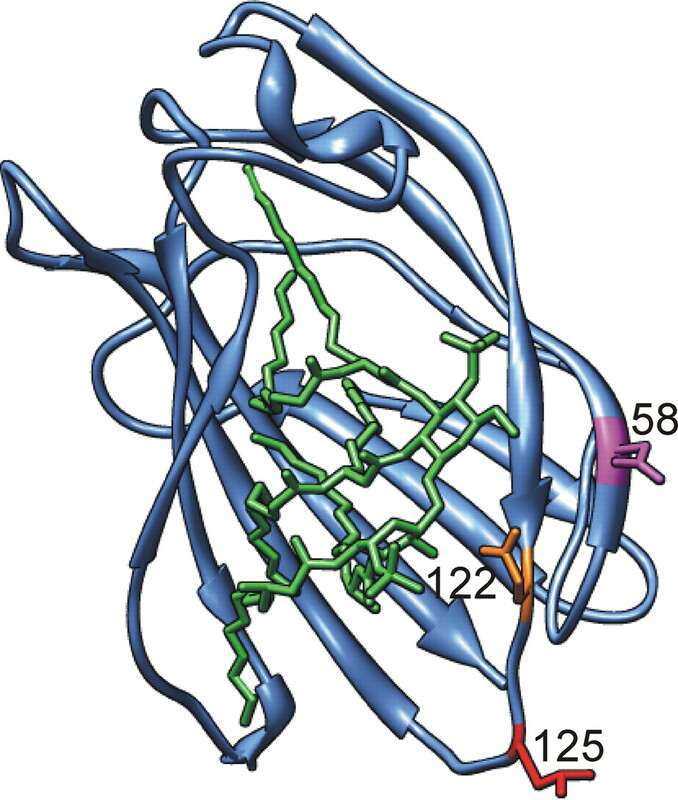 We analyzed 3D structures and models for the potential interactions of Lys125 of MD-2 with ectodomain of TLR4 but found no simple explanation, as there are no anionic residues within the expected interacting range on either human or murine TLR4 secondary binding site. We demonstrated an important role of charged residue at this position through mutations of murine and human MD-2. The possible reason for the effect of Lysine at position 125 may be due to its effect on the electrostatic potential that may affect electrostatic steering of the complex formation. An alternative explanation may be that residue such as leucine may lead to the formation of nonproductive complex, interacting with an alternative site of the MD-2 · LPS · TLR4 ectodomain, which does not allow a proper orientation of intracellular Toll/interleukin-1 receptor domains to support downstream signaling. An important implication of our findings is that mobilization of functional sMD-2 seems much less likely to occur in mice than in humans. Soluble secreted MD-2 is detectable in normal human plasma (38) but all or nearly all sMD-2 detected under these circumstances is inactive, presumably present as inactive multimers. However, under conditions of acute inflammation, total levels of sMD-2 increase markedly and bioactive sMD-2 is detectable at levels that are potentially functionally significant (38). Moreover, in anatomic settings such as the airway in which cells expressing TLR4 and MD-2 (e.g., macrophages) neighbor cells that express TLR4 but not MD-2 (e.g., epithelia) (39), the half-life of sMD-2 as well as the extent to which MD-2 is expressed in molar excess of TLR4 could determine not only the amount of bioactive sMD-2 in the extracellular fluid but also the extent to which cells expressing TLR4 without MD-2 can gain increased endotoxin responsiveness by using sMD-2 to form functional MD-2 · TLR4 heterodimers. By taking advantage of the sensitive and specific assays of host-endotoxin interactions that we have developed, it should be possible in the future to determine whether the mobilization and function of sMD-2 in mice and humans differ and if this difference contributes to the generally greater sensitivity of humans in comparison with mice to endotoxin exposure. ↵1 The project was supported by grants from the Slovenian research agency (J1-9795, J1-2271, P4-0176), a bilateral Slovenian-USA collaborative grant, and grants from the National Institute of Allergy and Infectious Disease (AI05732; to J.W.) and the Veterans’ Administration (to T.L.G.). ↵3 Abbreviations used in this paper: E, endotoxin; LOS, lipooligosaccharide; LBP, LPS-binding protein; s, soluble; HEK, human embryonic kidney; HSA, human serum albumin; wt, wild type; RLA, relative luciferase activity; TLR4ecd, TLR4 ectodomain. Jerala, R.. 2007. Structural biology of the LPS recognition. Int. J. Med Microbiol. 297: 353-363. Gioannini, T. L., J. P. Weiss. 2007. Regulation of interactions of Gram-negative bacterial endotoxins with mammalian cells. Immunol. Res. 39: 249-260. Tobias, P. S., K. Soldau, J. A. Gegner, D. Mintz, R. J. Ulevitch. 1995. Lipopolysaccharide binding protein-mediated complexation of lipopolysaccharide with soluble CD14. J. Biol. Chem. 270: 10482-10488. Gioannini, T. L., A. Teghanemt, D. Zhang, E. N. Levis, J. P. Weiss. 2005. Monomeric endotoxin:protein complexes are essential for TLR4-dependent cell activation. J. Endotoxin Res. 11: 117-123. Re, F., J. L. Strominger. 2002. Monomeric recombinant MD-2 binds toll-like receptor 4 tightly and confers lipopolysaccharide responsiveness. J. Biol. Chem. 277: 23427-23432. Miyake, K.. 2004. Endotoxin recognition molecules, Toll-like receptor 4-MD-2. Semin. Immunol. 16: 11-16. Viriyakosol, S., P. S. Tobias, R. L. Kitchens, T. N. Kirkland. 2001. MD-2 binds to bacterial lipopolysaccharide. J. Biol. Chem. 276: 38044-38051. Akashi, S., Y. Nagai, H. Ogata, M. Oikawa, K. Fukase, S. Kusumoto, K. Kawasaki, M. Nishijima, S. Hayashi, M. Kimoto, K. Miyake. 2001. Human MD-2 confers on mouse Toll-like receptor 4 species-specific lipopolysaccharide recognition. Int. Immunol. 13: 1595-1599. Kawasaki, K., S. Akashi, R. Shimazu, T. Yoshida, K. Miyake, M. Nishijima. 2001. Involvement of TLR4/MD-2 complex in species-specific lipopolysaccharide-mimetic signal transduction by Taxol. J. Endotoxin Res. 7: 232-236. Shimazu, R., S. Akashi, H. Ogata, Y. Nagai, K. Fukudome, K. Miyake, M. Kimoto. 1999. MD-2, a molecule that confers lipopolysaccharide responsiveness on Toll-like receptor 4. J. Exp. Med. 189: 1777-1782. Visintin, A., K. A. Halmen, N. Khan, B. G. Monks, D. T. Golenbock, E. Lien. 2006. MD-2 expression is not required for cell surface targeting of Toll-like receptor 4 (TLR4). J. Leukocyte Biol. 80: 1584-1592. Saitoh, S., S. Akashi, T. Yamada, N. Tanimura, F. Matsumoto, K. Fukase, S. Kusumoto, A. Kosugi, K. Miyake. 2004. Ligand-dependent Toll-like receptor 4 (TLR4)-oligomerization is directly linked with TLR4-signaling. J. Endotoxin Res. 10: 257-260. Hajjar, A. M., R. K. Ernst, J. H. Tsai, C. B. Wilson, S. I. Miller. 2002. Human Toll-like receptor 4 recognizes host-specific LPS modifications. Nat. Immunol. 3: 354-359. Kawasaki, K., K. Gomi, Y. Kawai, M. Shiozaki, M. Nishijima. 2003. Molecular basis for lipopolysaccharide mimetic action of Taxol and flavolipin. J. Endotoxin Res. 9: 301-307. Kawasaki, K., S. Akashi, R. Shimazu, T. Yoshida, K. Miyake, M. Nishijima. 2000. Mouse toll-like receptor 4.MD-2 complex mediates lipopolysaccharide-mimetic signal transduction by Taxol. J. Biol. Chem. 275: 2251-2254. Resman, N., H. Gradisar, J. Vasl, M. M. Keber, P. Pristovsek, R. Jerala. 2008. Taxanes inhibit human TLR4 signaling by binding to MD-2. FEBS Lett. 582: 3929-3934. Fujimoto, T., S. Yamazaki, A. Eto-Kimura, K. Takeshige, T. Muta. 2004. The amino-terminal region of toll-like receptor 4 is essential for binding to MD-2 and receptor translocation to the cell surface. J. Biol. Chem. 279: 47431-47437. Park, B. S., D. H. Song, H. M. Kim, B. S. Choi, H. Lee, J. O. Lee. 2009. The structural basis of lipopolysaccharide recognition by the TLR4-MD-2 complex. Nature 458: 1191-1195. Ohto, U., K. Fukase, K. Miyake, Y. Satow. 2007. Crystal structures of human MD-2 and its complex with antiendotoxic lipid IVa. Science 316: 1632-1634. Gruber, A., M. Mancek, H. Wagner, C. J. Kirschning, R. Jerala. 2004. Structural model of MD-2 and functional role of its basic amino acid clusters involved in cellular lipopolysaccharide recognition. J. Biol. Chem. 279: 28475-28482. Gangloff, M., N. J. Gay. 2004. MD-2: the Toll ‘gatekeeper’ in endotoxin signalling. Trends Biochem. Sci. 29: 294-300. Giardina, P. C., T. Gioannini, B. A. Buscher, A. Zaleski, D. S. Zheng, L. Stoll, A. Teghanemt, M. A. Apicella, J. Weiss. 2001. Construction of acetate auxotrophs of Neisseria meningitidis to study host-meningococcal endotoxin interactions. J. Biol. Chem. 276: 5883-5891. Vasl, J., P. Prohinar, T. L. Gioannini, J. P. Weiss, R. Jerala. 2008. Functional activity of MD-2 polymorphic variant is significantly different in soluble and TLR4-bound forms: decreased endotoxin binding by G56R MD-2 and its rescue by TLR4 ectodomain. J. Immunol. 180: 6107-6115. Teghanemt, A., R. Fabio, P. Prohinar, R. Widstrom, T. L. Gioannini, J. P. Weiss. 2007. Novel roles in human MD-2 of phenylalanine 121 and 126 and tyrosine 131 in activation of Toll-like receptor 4 by endotoxin. J. Biol. Chem. 283: 1257-1266. Visintin, A., K. A. Halmen, E. Latz, B. G. Monks, D. T. Golenbock. 2005. Pharmacological inhibition of endotoxin responses is achieved by targeting the TLR4 coreceptor, MD-2. J. Immunol. 175: 6465-6472. Prohinar, P., F. Re, R. Widstrom, D. S. Zhang, A. Teghanemt, J. P. Weiss, T. L. Gioannini. 2007. Specific high affinity interactions of monomeric endotoxin: protein complexes with Toll-like receptor 4 ectodomain. J. Biol. Chem. 282: 1010-1017. Muroi, M., K. Tanamoto. 2006. Structural regions of MD-2 that determine the agonist-antagonist activity of lipid IVa. J. Biol. Chem. 281: 5484-5491. Walsh, C., M. Gangloff, T. Monie, T. Smyth, B. Wei, T. J. McKinley, D. Maskell, N. Gay, C. Bryant. 2008. Elucidation of the MD-2/TLR4 interface required for signaling by lipid IVa. J. Immunol. 181: 1245-1254. Kawasaki, K., H. Nogawa, M. Nishijima. 2003. Identification of mouse MD-2 residues important for forming the cell surface TLR4-MD-2 complex recognized by anti-TLR4-MD-2 antibodies, and for conferring LPS and taxol responsiveness on mouse TLR4 by alanine-scanning mutagenesis. J. Immunol. 170: 413-420. Kennedy, M. N., G. E. Mullen, C. A. Leifer, C. Lee, A. Mazzoni, K. N. Dileepan, D. M. Segal. 2004. A complex of soluble MD-2 and lipopolysaccharide serves as an activating ligand for Toll-like receptor 4. J. Biol. Chem. 279: 34698-34704. Teghanemt, A., R. L. Widstrom, T. L. Gioannini, J. P. Weiss. 2008. Isolation of monomeric and dimeric secreted MD-2 endotoxin sCD14 and Toll-like receptor 4 ectodomain selectively react with the monomeric form of secreted MD-2. J. Biol. Chem. 283: 21881-21889. Visintin, A., A. Mazzoni, J. A. Spitzer, D. M. Segal. 2001. Secreted MD-2 is a large polymeric protein that efficiently confers lipopolysaccharide sensitivity to Toll-like receptor 4. Proc. Natl. Acad. Sci. USA 98: 12156-12161. Resman, N., J. Vasl, A. Oblak, P. Pristovsek, T. L. Gioannini, J. P. Weiss, R. Jerala. 2009. Essential roles of hydrophobic residues in both MD-2 and toll-like receptor 4 in activation by endotoxin. J. Biol. Chem. 284: 15052-15060. Wolfs, T. G., I. Dunn-Siegrist, C. van't Veer, C. M. Hodin, W. T. Germeraad, M. A. van Zoelen, R. J. van Suylen, C. J. Peutz-Kootstra, G. Elson, J. Pugin, W. A. Buurman. 2008. Increased release of sMD-2 during human endotoxemia and sepsis: a role for endothelial cells. Mol. Immunol. 45: 3268-3277. Pettersen, E. F., T. D. Goddard, C. C. Huang, G. S. Couch, D. M. Greenblatt, E. C. Meng, T. E. Ferrin. 2004. UCSF chimera: a visualization system for exploratory research and analysis. J. Comput. Chem. 25: 1605-1612.